To study the precise mechanisms underlying the chlorosis caused by plant viruses, we previously established a synchronous experimental system using transgenic plants expressing Cauliflower mosaic virus multifunctional protein, Tav (transactivator/viroplasmin), under the control of an artificially inducible promoter. Shortly after the induction of Tav expression, pathogenesis-related protein (PR) 1a gene expression is upregulated in the transgenic tobacco lines, which show visible chlorosis within a week. The present study showed that the expression of Tav also induces some salicylic acid (SA)- and ethylene-responsive PR genes. In contrast to transiently expressed Tav, which suppressed Agrobacterium-induced and SA-induced PR1a expression, the artificial induction of Tav from the transgene did not affect SA-induced PR1a expression, rather it alone induced PR1a expression. In a deletion analysis, chlorosis and PR1a induction function in transgenic tobacco were mapped to a region in Tav that had been shown to have a role in pathogenesis in a susceptible host, elicitation of the hypersensitive response in a resistant host, suppression of RNA silencing, and the suppression of Tomato bushy stunt virus P19-mediated cell death in tobacco. The results suggest that Tav-induced chlorosis results from a host response, which accompanies PR1a induction, to pathogenic function of Tav. The online version of this article (doi: 10.1007/s10327-015-0600-4) contains supplementary material, which is available to authorized users. The authors thank the anonymous reviewers for valuable comments and suggestions to improve the paper and Reiko Tomita and Kazue Obara for technical assistance. 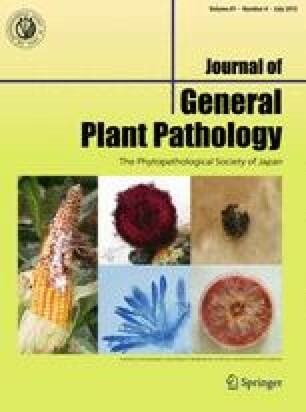 This study was supported in part by the Ehime University United Graduate School of Agricultural Sciences (to WS and KK), JST ALCA (FS stage; to KK), JSPS KAKENHI Grant Number 26292026 (to KK) and the Program for Promotion of Basic and Applied Researches in Bio-oriented Industry (to MN), and JSPS KAKENHI Grant Number 24580065 (to MN). WS is supported by a scholarship from the Rotary Yoneyama Memorial Foundation.